As solicitors we often say that we look after your legal interests ‘from cradle to grave’. Indeed, we don’t just start with the interests of young children, such as in residence and care cases. We even examine those of the unborn, with procedures for DNA testing. Following on, there are all the successive stages of education, employment, renting, owning property, family cases, business and corporate issues, wills and trusts. Later in the cycle, we look at Law for the Elderly, succession planning, powers of attorney, and probates. 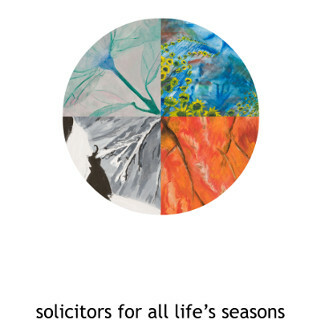 As a solicitor who also practices as an artist, I have chosen to represent this life cycle work with a Photoshop of four of my paintings which represent Spring, Summer, Autumn and Winter. I have called it the Italian for four seasons, Quattro Stagioni, which also allows for a little humour as the design reflects the slices of the famous pizza. I also noticed that each of my original paintings had a line or ‘vein’ within them. I decided to join these veins together in the Photoshop work.